Bogs and wet conifer swamps (tamarack, spruce); thickets and old dune or rock ridges; borders of hardwoods; may be low and sprawling on bare rock shores and ledges, otherwise a tall shrub. Presumed hybrids from Cheboygan and Crawford Cos. resemble A. bartramiana very closely. The disjunct southernmost station in Kent Co. was east of Grand Rapids (E. J. Cole in 1894, MICH). This is ordinarily our most distinct species, with short petioles, blades ± pointed at both ends, and petals shaped like those of Prunus. The summit of the ovary is densely tomentose and tapers into the base of the style, while in the other species the ovary is flat or rounded at the top. 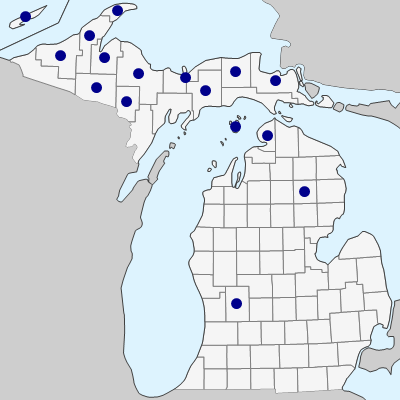 Fortunately, the range of A. bartramiana in Michigan largely avoids the concentration of other species in the Lower Peninsula, for when A. bartramiana grows with another species, intermediates may be expected. In hybrids with A. laevis, which appear to be rather common, the pubescence on the ovary may be sparser and the flowers more numerous than usual for A. bartramiana, although the leaf blades are shaped more like those of A. bartramiana than the subcordate ones of A. laevis. Hybrids with other species possessing a tomentose ovary are less easily recognized, but in addition to the combination of leaf shape and several-flowered racemes, the leaves of hybrids may be more pubescent than in the essentially glabrous-leaved A. bartramiana. MICHIGAN FLORA ONLINE. A. A. Reznicek, E. G. Voss, & B. S. Walters. February 2011. University of Michigan. Web. April 19, 2019. https://michiganflora.net/species.aspx?id=2422.